The biggest auction of the year took place on Friday July 20 with O’Donnellan & Joyce placing 25 properties up for sale and successfully selling 23; the remaining two being are the subject of active negotiation. More than 400 people packed into the Victoria Hotel for this extraordinary auction. There was a huge sense of excitement in the room, which was filled to capacity, with people spilling out into the foyer of the hotel where the auction was broadcast on television screens so everybody could view the properties on offer. The first property to be auctioned was of three acres of land on the Barna Road. This land was zoned for recreational amenity. With an anticipated price of €30,000, auctioneer Colm O’Donnellan asked for bids which opened at €25,000 and increased in increments of €2,000 until it eventually sold for €61,000. The second property to be auctioned off was a three/four bedroom semidetached house at No 11 Beechmount, Highfield Park, which needed modernisation and had an AMV of €150,000. The property attracted five bidders. Bidding commenced at €140,000 and increased in increments of €5,000 as bids came from around the room. When it eventually reached €205,000, the bidding was left to two female bidders who chased the property until the auctioneer’s hammer eventually came down at €211,000. The next property was a detached residence on half an acre at Norsdale, Clybaun Road. The property, which needs extensive refurbishment, had an AMV of €185,000; bidding commenced at that price and went to €260,000. No 17 Lenaboy Park, Salthill, a distinctive semidetached residence over three floors, in need of modernisation, had an AMV of €270,000. Bidding began at €250,000 and several savvy individuals chased the opportunity to live in one of Galway’s most popular locations. Reaching an impressive €310,000, the hammer finally fell to the delight of one lucky purchaser. The fifth property was Freland, Whitestrand Road, Salthill. This three bed bungalow was ideally located just a short stroll from both Salthill Promenade and Galway city centre. Several bidders vied for the property, which eventually landed a sale price of €312,000; €32,000 above its original AMV. The sixth property was No 8 Rahoon Road, Shantalla, a five bedroom detached residence within walking distance of NUIG and UHG. Bidding commenced at the AMV of €125,000 and three enthusiastic bidders chased the property until it sold for an impressive €164,000. The seventh property, Rockmore House, Athenry, was a substantial period listed residence of 5,000sq ft and was being sold with circa 22 acres of quality farmland. While in need of substantial refurbishment and modernisation, there was no doubt that this property had the potential to be transformed into a magnificent family home. Bidding commenced at €395,000 and easily surpassed the AMV of €400,000, with the hammer finally coming down at €485,000. The eighth property being sold was approximately 55 acres of agricultural land at Farnablake and Furzypark, Athenry, which had an AMV of €450,000. The bidding started off just below this at €420,000 and reached a sale price of €515,000. 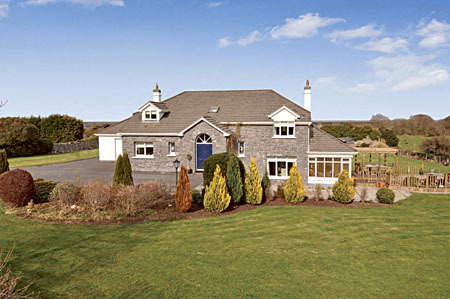 No 6 Westlodge, Athlone, Co Westmeath, was considered the best value of the day. Situated just minutes from Athlone town centre, this spacious four bedroom semi had an AMV of €45,000. Bidding commenced at €40,000 and one lucky purchaser eventually secured this bargain for a mere €66,000. No 17 Walshe’s Terrace, Woodquay, a three bed terraced house in the heart of old Galway, was the 10th property to be placed under the hammer. With an AMV of €250,000, the bidding commenced at €220,000. There was great excitement in the room as several enthusiastic bidders chased the property past its AMV in increments of €5,000, when it sold for an impressive €298,000. The 11th property to be auctioned was a semidetached property in Hazel Park, Newcastle. The property, which was within walking distance of NUIG, attracted two interested buyers. Bidding commencing at €140,000 and within five minutes of intense bidding, the property was eventually sold for €150,000 to a delighted purchaser. The 12th property to be auctioned was No 50a Cruachan Park, Rahoon, a detached four bedroom house located approximately two miles from the city centre. Bidding commenced at €190,000 and increased in increments of €5,000 with three people bidding against each other for the property until it reached €200,000. With two individuals bidding against each other, increasing in increments of €2,000 at a time, the property was eventually sold at €219,000. The next property to be auctioned was No 14 St Bridget’s Place Upper, an end of terrace residence which had been subdivided into two flats. Bidding commenced at €135,000 and, like a runaway train, five different individuals bid for the property until it reached €160,000. Just when it looked like the property was about to the sold, a new bidder increased the bid to €162,000 and within an intense period of three minutes it rose rapidly and was sold at €186,000. The next property to be auctioned was No 79 Tudor Lawns, Newcastle. Bidding commenced at €225,000 and increased to €247,000. As it did not reach the reserve price, auctioneer Colm O’Donnellan went out to consult with his client who consented to the property being placed on the market and it was sold for €247,000. The 15th property to be auctioned off was No 29 Carraig Mor, Lackagh. This four bed dormer bungalow had some internal flood damage and bidding commenced at €90,000. Four individuals bid intensely for the property, increasing in increments of €2,000 and it was sold for €114,000 to a delighted purchaser. The 16th property to be auctioned was No 109 Upper Newcastle. The property, which had a pre-auction bid of €235,000, looked like it was just about to be withdrawn a bid of €235,000 came from the floor. Two bidders interchanged in increments of €5,000 and it was sold for €245,000. The seventeenth property to be auctioned was No 3 Barrack Street, Clarinbridge. Described as a mid-terraced house situated in the heart of oyster country, bidding started at €150,000 and rose to €172,000. With no further bids in the room, the auctioneer consulted with the client and it was placed on the market and sold. The next property to be auctioned off was a substantial detached residence at Ardskeamore, Cummer, Corofin. This property was a delighted four bed bungalow situated in a rural setting. Bidding commenced at €125,000 and was sold for €131,000. The 19th property, located at Moyvilla, Oranmore, had an AMV of €260,000 and negotiations were entered into by a keen purchaser and it was sold in the course of the auction for an undisclosed sum. The 20th property was a detached residence of 3,700sq ft standing on 1.7 acres at Tooreeney, Moycullen. This property, which was probably one of the highlights of the auction, commenced at €410,000. Two bidders interchanged rapidly to €470,000 and, just as it looked that it had come to a standstill and the auctioneer went out to consult with the sellers, the bidding increased even further and went as high as €504,000 when the auctioneer’s hammer fell to the delight of the purchaser. The 21st property to be sold was No 26 Gleann Noinin, a two bedroom home situated approximately five minutes’ walk from Eyre Square. The property was described by the agents as a gilt-edged investment and it achieved a price of €120,000. A three bed terraced house at No 76 Mullan Mor, Tuam Road, also reached a price of €120,000. Colm O’Donnellan of O’Donnellan & Joyce auctioneers said it was a great auction for both sellers and buyers with a substantial number of the properties achieving 10 to 15 per cent in excess of what was anticipated. He said the auction room held a mixture of home owners and investors returning to the market for the first time in four years — perhaps a sign that the market has finally reached the bottom and some form of normality may be returning to the property market. O’Donnellan & Joyce’s next auction will be held at the end of September. For further details contact the O’Donnellan & Joyce Auction Team on (091 ) 564212.